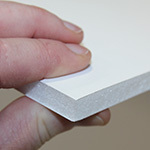 Forex Smart™ is a lamination of expanded styrene with both front and back surfaces made from solid styrene. 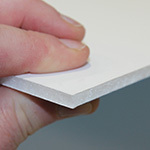 This gives the product a high degree of rigidity whilst retaining lightweight, making it ideal for free-standing and ceiling hanging applications. Forex Smart is 100% recyclable. It is exceptionally white before printing and was designed specifically for flatbed digital printing; is remarkably dimensionally stable and is also suitable for exterior use of up to 2 years.